Arcing across the flatlands of the Somerset Levels, the Polden Hills rise from the M5 near Bridgwater and snake eastwards to the small town of Street, before turning south to Somerton. At their highest they rise to little more than 100m but in places their slopes are very steep. The range is built on relatively soft rocks – comprising alternating beds of blue lias limestone and mudstone. On the west-facing flanks of the range near Compton Dundon, these rocks are exposed on certain steep slopes as colourful horizontal bands. Gilling Down, a Somerset Wildlife Trust reserve, is possibly the largest of these. South of Street, the ridge is clothed in planted and semi-natural woodland giving way to unimproved limestone grassland on the west-facing flanks. Much of it is managed by a conservation-led trust and is accessible to the public. 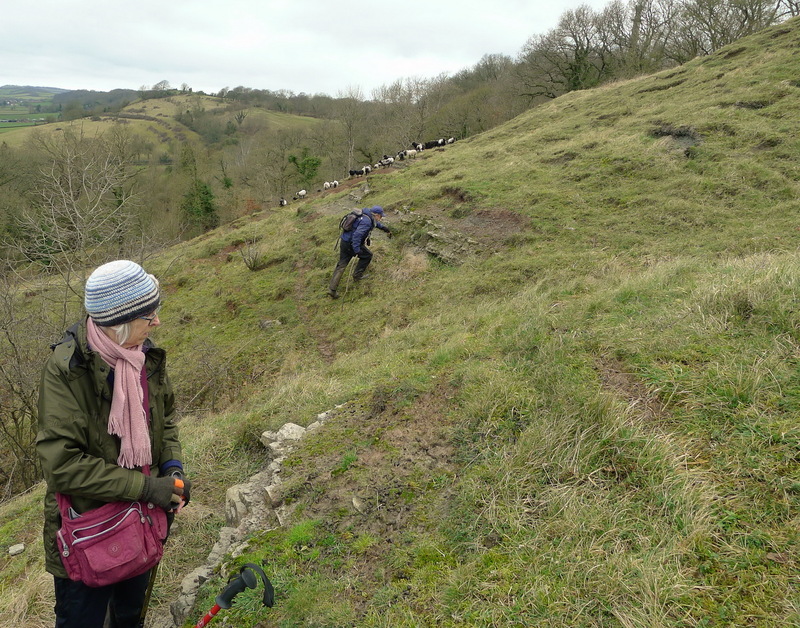 Our visit began in the free car park at Combe Hill and headed west to limestone grassland and bare rock exposures at Combe Hill. Hands and knees work quickly detected Entodon concinnus and Trichostomum crispulum, and some splendid patches of Tortula lanceola, with rich chestnut capsules. Heading downslope, more sheltered conditions favoured large mounds of Hylocomium splendens and Rhytidiadelphus triquetrus but massed reddish capsules of a smaller moss on an ant-hill quickly distracted us. These plants turned out to be the rare and very beautiful Pterygoneurum ovatum – a very good start. Emerging then onto the steep, limestone grassland scarp of Hatch Hill, we concentrated on searching for Leptodon smithii, a characteristic and often frequent epiphyte of the Polden Hills. Alan and Marion had not seen this species previously but were unimpressed by the tatty patch we did eventually track down on an ash tree. Along the way we came across the rich limestone grassland and rock exposures where I’d seen Pterygoneurum papillosum in 2015. 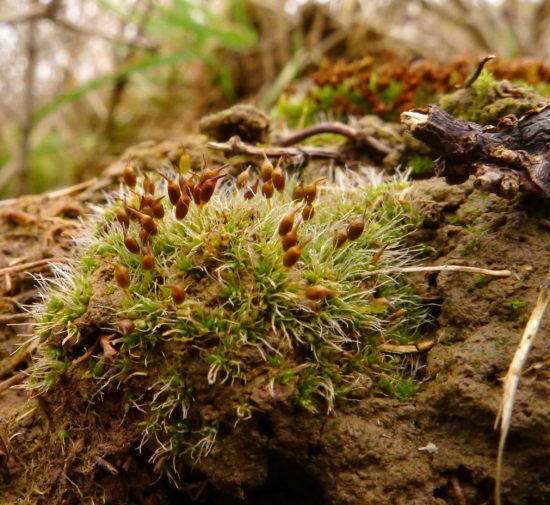 This very rare annual moss was discovered new to Britain in 2014. Its discovery prompted a flurry of checking old herbarium specimens filed as P. ovatum, which confirmed that some specimens collected from the Polden Hills were in fact P. papillosum. Substantial populations were then confirmed in limestone grassland in the Poldens, which remains the British stronghold for this species. Limestone grassland habitat of P. papillosum, beatifully grazed by rare breeds sheep. Where ledges of blue lias are exposed in the grassland, thin, sheep-poached clays overlie them and this is the favoured habitat of P. papillosum. We quickly found some plants, minute but easy to tell with a hand-lens due to the concave leaves with short hair-point and flaps (lamellae) overlying the nerve. Other species of interest in this grassland included Thuidium assimile and Didymodon acutus, its dark brown shoots with erect, sharp-tipped leaves setting it apart from the much commoner D. fallax. We took the easy path back across the top of the scarp to return to our cars. Along the way we stopped to look at epiphytes on some lovely and very majestic sprawling hazels on what appeared to be an old boundary bank of soil and limestone. On this we found a population of Plasteurhynchium striatulum, unexpected so far from its classic hard limestone Mendip haunts. 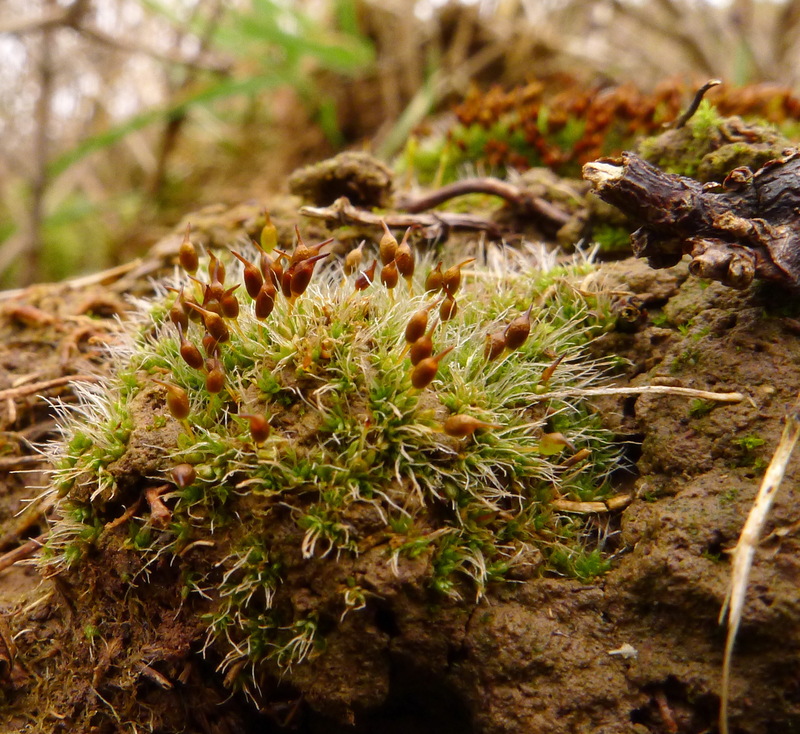 We also found beech trees with masses of Cololejeunea minutissima and the dainty plants of Orthotrichum pulchellum.